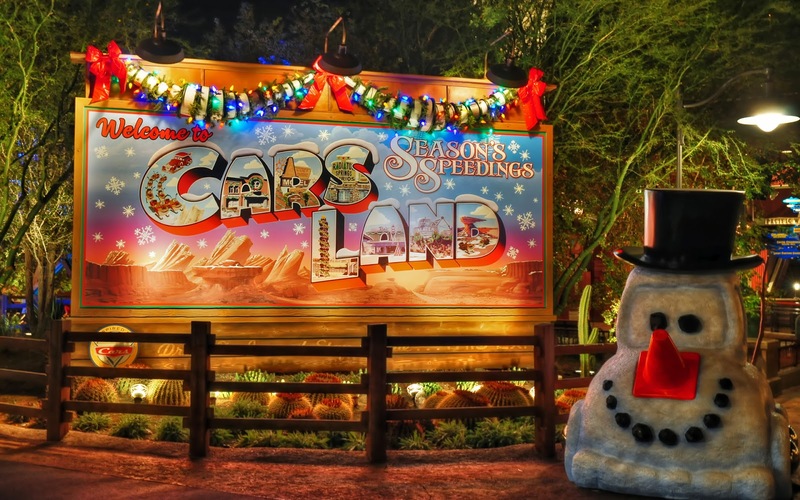 Ever since Cars Land unveiled its "Carsmas" holiday overlay, crowds have been flocking to see the festive decorations and Christmas trim. Granted, they've been flocking to see Cars Land before, but this merry time of year brings a special magic to the land. In front of it all, next to a special Cars Land entrance sign designed just for the holidays, is this cute little "snow car." It's quite a popular photo op. Most days, there's a nice little line of guests waiting to take pictures with the car. It's simple and charming, a lot like Radiator Springs! And it's another fantastic feature of Cars Land during Christmas time! This delightful holiday addition to Cars Land sits happily at peace in the late evening.